7.3.1 Why does it matter what time of day that I choose to operate my leaf blower? 7.3.2 What is the main difference between gas powered and battery powered blowers? 7.3.3 What projects are cordless handheld leaf blowers best for? 7.3.4 What does CFM represent? Finding the best cordless leaf blower can be difficult. This post reviews some of the top models around and brings you a buyers guide. So you’ve made the wise decision to go cordless. We don’t blame you at all! Feeling constrained by the amount of slack left on your cable will now be a thing of the past for you. However, if you’re looking to buy a leaf blower without cords there’s a few things you’ll need to know. If you’re just doing light work around your yard you may be more suited to a lightweight battery powered blower. If you’re looking for something of a commercial standard for mass leave removal consider a gas powered model (which are typically slightly heavier). In this post we will be bring you cordless leaf blower reviews, as well as a buyers guide later in the post. Generally speaking battery powered leaf blowers are lightweight and energy efficient. Often battery powered tools mean sacrificing power output. Yet, battery powered leaf blowers pack an impressive punch when it comes to blowspeed. Traditionally electric leaf blowers main constraint has been their cord length. When using a battery this isn’t a problem. Your main concern will be the battery life, which isn’t a huge issue any more. These days battery powered leaf blowers hold very respectable running times. You’ve always got the option of purchasing an additional battery. This will give you twice the running time. So to kick off the review section we start by reviewing 6 excellent battery powered cordless leaf blowers. The advantage with battery powered blowers is they’re easily powered using your charger, unlike gas models. You will also find battery leaf blowers are more environmentally friendly and are generally more lightweight. Below is a list of the 6 best battery powered leaf blowers. First up on our list of the best cordless leaf blowers is the Dewalt DCBL720P1 Max Lithium-Ion Brushless Blower. This blower boasts a completely brushless motor that provides increased motor efficiency and durability. This battery powered blower comes fully equipped with an innovative axial fan that is designed to maximize air output and runtime. This Dewalt blower has all the bells and whistles onboard including a variable trigger and speed lock in its ergonomic design. The blower is powered by an included 20-volt max 5.0 amp lithium ion battery and delivers an astounding 400 CFM and 90 MPH performance. An added bonus of this high-speed blower is the interchangeable 20-volt battery that is compatible with over 100 Dewalt family of tools. The Greenworks 40 volt blower packs a powerful punch and flaunts impressive max speeds of up to 150 MPH.This Greenworks blower features a 40-volt G-max lithium-ion battery that provides more power and a longer runtime to complete your heavy duty outdoor blowing projects. The extension tube accessory provides for extended reach and longer range in order to blow those harder to reach areas while reducing strain and cleaning up your workspace. The Greenworks blower has a super lightweight design and comes in at just under 4 pounds for easy and efficient handheld blowing. This super lightweight design provides for easy handling and maneuverability of this blower. The included 40-volt G-Max lithium-ion battery offers interchangeable compatibility with over 40 of Dewalt’s landscaping and power tools. Next in line is another member of the Dewalt family. The DEWALT DCBL770X1 FLEXVOLT 60V MAX Lithium-Ion Brushless Handheld Blower promises to power through debris at up to 423 CFM of air volume with max speeds of up to 129 MPH. This Dewalt blower is able to handle your toughest blowing projects and can withstand everyday heavy duty usage to meet all of your outdoor blowing needs. The built-in high-efficiency motor is brushless in order to maximize the blowers runtime and extend motor life. Additional features of this Dewalt blower include a variable speed trigger and speed lock for total power and control. Coming in at just under 10 pounds, this blower is easy to use with its lightweight and ergonomic design. Our next review is for a familiar family of top-notch landscaping and power tools. Meet the Black and Decker LSW36. This Black and Decker blower is powered by an included 40-volt lithium-ion rechargeable battery that delivers maximum power with an extended runtime to complete tough jobs. The Black and Decker Lithium Sweeper has advance power command controls for maximum runtime and maximum power. This blower is ideal for use for blowing debris from hard surfaces including patios, decks, walkways, driveways, and garages. The Lithium Sweeper is ergonomically designed with a soft grip handle and is one of the lighter weight blowers in its’ class that provides for easy handling at just 4.7 pounds. The blower feature a blow tube with a built-in scraper that allows for loosening of matted leaves and stuck on debris from hard to reach places. Another Black and Decker blower is the LSW221 20 Volt Max Lithium Cordless Sweeper. This blower has a maximum air speed of up to 130 MPH to power through your tough projects. This cordless sweeper is powered by a 20-volt max lithium ion battery that can hold a charge for up to 18 months. The Black and Decker Lithium Cordless Sweeper has a lightweight and ergonomic design for easy handheld operation and use and delivers low noise during outdoor operation. This blower is a member of the Black and Decker family of lawn and garden power tools that operate on the included interchangeable 20-volt extended life max battery for versatility in use. This Black and Decker cordless sweeper makes cleaning hard surfaces like patios, driveways, and garages a breeze. The Worx WG545 Cordless Hi-Capacity Blower with included battery provides battery operated cordless convenience in order to efficiently clean your hard surface projects like decks, driveways, and sidewalks. This Worx blower is ideal for cleaning hard to reach places and other hard surfaces. This battery operated blower delivers up to 120 MPH air speed with 80 CFM air flow. The Worx features a lightweight and ergonomic design. This battery powered blower weighs in at a discreet and easy to handle pounds. The Worx features 8 available attachments that are included to help you create a pristine work area and patented Cleanzone technology. This cordless high capacity blower can be used interchangeably with compatible Worx powered lawn and landscape tools. Despite us loving every battery leaf blower we reviewed we had to pick a winner. After plenty of careful consideration we decided that our top rated leaf blower of 2018 has to be the DEWALT DCBL770X1. This is down to the fact it’s an excellent battery powered leaf blower, holding it’s own when compared to the max blow speed of its gas counterparts. Blowing at an impressive 175 mph when using the flat concentrator. Weighing an impressive 9 lbs it’s also far from heavy and comes with a 3 year limited Dewalt warranty. We consider this to be the best lithium-ion cordless leaf blower around. If you’re looking for something associated with a bit more power, it’s likely you’ll be considering a gas powered leaf blower. As you should know now gas powered leaf blowers are generally slightly heavier than battery powered leaf blowers. However, what they lack in elegance they make up for in raw power. This is why you’ll find that most commercial grade cordless leaf blowers tend to be gas powered. In this next section we bring you 5 gas powered leaf blower reviews. This will help give you an idea of what you should look for in a great quality gas powered blower. Below we’ve listed 5 of the best gas leaf blowers available to date. This lightweight high-velocity gas powered blower weighs in at 8.6 pounds providing for easy handling and use while maintaining your outdoor hard surfaces. This handheld commercial grade blower comes equipped with a 2 stroke engine that provides for outstanding performance and an extended life. The Hitachi blower delivers an impressive 170 MPH air velocity via its’ built-in tapered nozzle. Advanced features of this blower include a large two finger throttle lever that provides for lower emissions and ease of operation and PureFire low emission technology to help keep you in compliance with EPA laws and regulations such as Proposition 65. One of the most outstanding features of this gas-powered blower is the extended 7-year warranty that speaks volumes about the quality and construction of this blower. The next blower that we reviewed is the Tanaka Commercial Grade Two-Stroke Gas Powered Handheld Blower With Cruise Control. The Tanaka is another commercial grade handheld gas powered blower that is at the top of its class and is designed for both commercial and consumer use. This commercial grade gas powered blower is built with a PureFire two-stroke engine that provides for high-velocity use and an extended blower life. The Tanaka handheld blower is lightweight in design and easy to use and carry coming in at just under eleven pounds. The Tanaka blower provides a dually extended warranty for commercial and consumer coverage. The commercial warranty provides for 2 years of warranty coverage. On the consumer end, the warranty is for a full 3 years. This compact handheld blower is a yard enthusiasts delight and designed to handle your outdoor projects with ease. Weighing in at a handy 8.8 pounds, this gas-powered handheld leaf blower packs a 2-stroke engine with 165 MPH Max speeds all into one convenient blower. If you’re looking for a handheld blower that combines max speeds, lightweight handling, and extended blowing capacity, then Echo may be just the thing that you need. The Echo handheld blower provides 391 CFM with a displacement of 25.4 CC for power packed blowing. This blower also has an EPA certified fuel tank capacity of 16.9 oz to provide excellent runtime for your outdoor blowing projects. This gas powered blower comes with extension attachment, powerhead, and pipes included in the box. Coming up next is the Husqvarna 952711925 125B Handheld Blower in Orange. This handheld gas powered blower is packed with loads of powerful features. The Husqvarna blower features high air volume and velocity providing for powerful cleaning performance and easy handling. The Husqvarna high-velocity blower delivers an impressive 170 MPH air velocity capability. Bonus features of this gas-powered blower include an auto return stop switch that automatically resets this blower to the On position for easier starting in between projects. The variable speed throttle places your handheld gas powered blower on cruise control that allows for easier handling and maneuverability during use. Designed for use for maintaining your outdoor hard surfaces like sidewalks, patios, and decks, this adjustable blower has an adjustable blowing tube length and intuitive controls. blower is designed for all-purpose clean up for your everyday outdoor home improvement and landscaping projects. The Troy-Bilt blower delivers up to 150 MPH of maximum airspeed and 450 CFM volume for high powered and efficient blowing. This gas powered blower has an onboard spring assist feature with built-in jumpstart technology for an easy start every time. This 4-cycle blower offers variable speed settings so that you can adjust your blower volume based on the size and scope of your projects including hard to reach areas. The extended output nozzle adds to this blowers functionality by providing an extending reach and reducing strain by moving air closer to the ground. So we’ve reviewed 5 great gas powered leaf blowers. But which model did we like best? After thorough comparison we have made our decision. We found the Hitachi RB24EAP is our top rated gas leaf blower. This is down to a couple of factors. Generally cordless gas blowers can be pretty heavy. However, this model has an excellent balance between maximum blow speed and its weight. Weighing in at just 8.6 lbs with a maximum blow speed of 170 MPH. These weren’t the only selling factors to us. We’re also really impressed with the low emission technology and the long 7 year warranty keeping you covered for years to come. Now that we’ve reviewed some of the best battery and gas-powered leaf blowers available on the market, you should have a better idea of what’s available to meet your individual outdoor project needs. Keep reading for a few tips on how to choose the best leaf blower for your outdoor projects. When choosing your next cordless leaf blower important factors to consider are the choices between gas and battery power, noise regulations and rules, desirable and undesirable features and safety equipment. 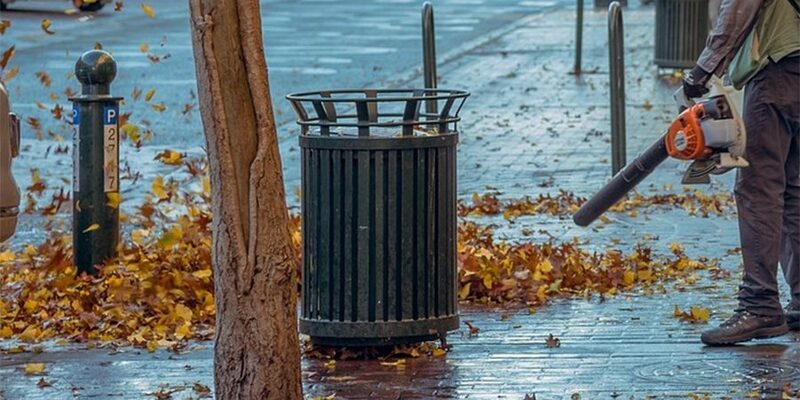 Leaf blowers are designed to assist with cleanup of your outdoor landscaping projects for hard surfaces such as sidewalks, garage floors, patios, decks, and other more pliable surfaces including grass, yards, and landscapes. There are a variety of cordless leaf blower options available for commercial and consumer use. The focus of this guide is on cordless blowers in the battery and gas-powered categories. According to research and experience, gas-powered blowers are designed to provide the best results as due to the nature of their construction. Battery powered blowers are rapidly becoming another favorite as they may not provide the precision results that a gas powered blower can provide, but these battery powered blowers definitely make up for that small difference in convenience and precision. Battery powered blowers are able to be used over a larger distance for a longer period of time than their gas or electric powered counterparts. This leads to the battery powered leaf blowers increasing popularity along with its easy to handle use. Low Noise Feature is an optional feature to reduce the amount of noise that yours and your neighbors’ ears are subjected to during your outdoor blowing projects. Beware that some municipalities enforce noise violations and definitely take this into consideration when purchasing your next cordless leaf blower. When embarking on your next leaf blowing project be mindful of the time of day that you’re using your new blower to avoid violating local noise ordinances. Choosing the best cordless leaf blower for your individual needs comes down to project size, scope, preference, and budget. Based on the information provided here you should be able to get a clearer picture of the best cordless leaf blower for your needs. Along with noise considerations, other important factors to consider are cordless leaf blower weight, costs, budget, and blowing capacity. It is important to choose a leaf blower that has a weight that you’re comfortable carrying for the duration of your outdoor blowing projects. Handle up to three differently weighted blowers to get a feel for your comfort level in order to make the best buying decision. When it comes to budget concerns gas-powered blowers are slightly more expensive than battery operated blowers and provide a slightly better result. Ask yourself if its worth the money to spend for such a minor difference in blowing capacity. Assess your long and short-term outside leaf blowing goals and choose the best model that falls in line with what your body and your budget can handle. While blowing leaves around your yard may seem like a harmless endeavor, there are some safety precautions that you want to take to avoid exposure or injury while operating your cordless leaf blower. The following are a few safety regulations to take to reduce the chance of undesirable results such as project extension or physical injury. Wear earplugs or earmuffs when operating your leaf blower to reduce the chances of damaging your ears due to extended exposure to noise. Choose comfortable-fitting goggles or other eye coverings that wrap around the sides of the face to prevent flying debris from entering your eyes and causing injury. Wear a dust mask or other breathable nose and mouth covering to avoid inhaling gas fumes, other toxic chemicals, and debris during your outdoor leaf blowing projects. Taking the recommended safety precautions will reduce the risk of injury and other undesirable outcomes. Why does it matter what time of day that I choose to operate my leaf blower? What is the main difference between gas powered and battery powered blowers? The main difference between these two types of blowers is efficiency and range. gas powered blowers may provide higher efficiency, while battery powered blowers provide for extended range and covering more ground. What projects are cordless handheld leaf blowers best for? Handheld blowers are best to use for small jobs around your home or office. If you intend to cover a larger amount of ground you may want to consider a backpack or wheeled blower for saving time and to achieve the best results. CFM – Represents the volume of air that flows out of the leaf blower tube in one minute. Not to be confused with MPH. For best capacity check the volume of both CFM and MPH before purchase to assure best results. Now that you’re fully educated on the ins and outs of cordless leaf blower operations and features, you should feel confident to proceed with purchasing your new blower. Remember to consider local rules and regulations related to noise in order to prevent being in violation and resulting in a delayed project. Wear recommended safety gear 100% of the time to prevent undesirable results such as project extension or personal injury. If you’re looking for a leaf blower you don’t need to carry, check out our guide on walk behind leaf blowers.